The Soft Matter Spectroscopy Laboratory ('SMS LAB') is a research group at the Dipartimento di Chimica e Chimica Industriale of the University of Pisa. During the last ten years, several research topics became central in our research projects. Our 'traditional' research activities are related to the chemical-physical study of liquid crystals (LCs) and liquid crystal elastomers (LCEs) by means of Nuclear Magnetic Resonance (NMR) in order to understand the origin of their peculiar properties at a molecular level (orientational order, conformational properties and dynamics). In addition, we extended our expertises on other kinds of soft materials, such as nanoparticles' dispersions, colloidal systems and food. In the recent years, we start working in the field of chemical-physical characterization of iron oxide nanoparticles to be used as contrast agents in magnetic resonance imaging (MRI). 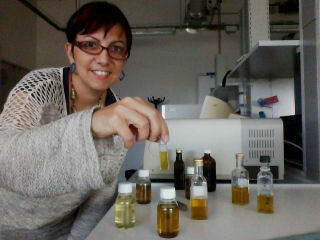 Our expertises include the chemical-physical study of food and agricultural products, such as olive oil, honey, pollens and wine, by using several spectroscopic methods, such as front-face fluorescence, UV-vis absorption spectroscopy and NMR tecniques.